Saracens boosted their hopes of qualifying for the Heineken Cup quarter-finals with a bonus point victory over Zebre in Italy. George Kruis, Ernst Joubert, Chris Wyles all ran in tries as Saracens dominated the first half. Chris Ashton added two more after the break before Samuela Vunisa scored a late consolation for the home side. 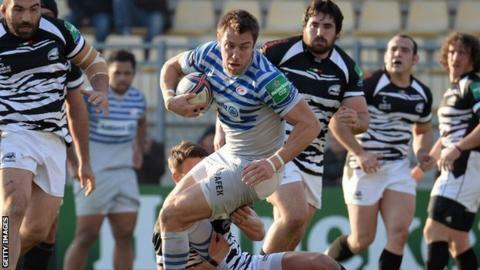 The Premiership leaders go top of Pool Three with Zebre rooted to the bottom after three straight defeats. The Italian side, who were formed in 2012, are 11th out 12 teams in the Pro12 table and did not have the quality to trouble Saracens, who secured their sixth successive win in all competitions. Fly-half Charlie Hodgson opened the scoring with a penalty before Kruis, Joubert and Wyles crossed to give the English side a 25-0 lead at half-time. Gonzalo Garcia finally put some points on the board for Zebre with a penalty, but Ashton secured a bonus point for Saracens with his first try of the afternoon. The England international then finished off a flowing backs move, after some brilliant work from Alex Goode in the build up. The Premiership leaders lost Duncan Taylor to the sinbin with seven minutes still remaining, allowing Zebre to take advantage and score their first try through Vunisa. However, it was still a comfortable win for Saracens, who host the Italian side in the return fixture next weekend. French side Toulouse host Connacht on Sunday in the pool's other game. Zebre: Palazzani, Sarto, Ratuvou, Garcia, Venditti, Iannone, Chillon, Perugini, T. D'Apice, Leibson, Geldenhuys, Bortolami, Bergamasco, Cattina, Vunisa. Replacements: Quartaroli for Garcia (54), Orquera for Iannone (59), Toniolatti for Chillon (62), De Marchi for Perugini (54), Manici for T. D'Apice (29), Redolfini for Leibson (62), van Vuren for Bortolami (63), Caffini for Cattina (51). Sin Bin: Vunisa (28), Bergamasco (34). Saracens: Goode, Ashton, Wyles, Taylor, Strettle, Hodgson, de Kock, Barrington, Brits, Johnston, Borthwick, Kruis, B. Vunipola, Brown, Joubert. Replacements: Bosch for Wyles (51), Farrell for Hodgson (62), Wigglesworth for de Kock (51), Saunders for Barrington (68), George for Brits (54), Stevens for Johnston (51), Sheriff for Borthwick (62), Wray for Brown (56).